I had heard of the Couch to 5k idea before, but a woman I work with recently mentioned it to me and this time I decided to check it out. It is finally nice enough to run outside and it has been the perfect weather for it- not too hot and not too cold! The idea of the Couch to 5k system is that it gradually builds up your running endurance so by the end of the program you can run a 5k, or about 3 miles without breaks. 3 miles may seem like nothing to you runner peeps out there, and it isn't a very long distance. But I haven't ran since before it cooled down this past Fall so I knew I was going to have to build back up. I have been doing the Jillian Michaels Ripped in 30 and 30 Day Shred DVDs for a long time now, since last summer, so I wasn't starting as a complete couch potato. However, running is a different kind of skill, I think, and one that does not come easily to me at all. I really feel like some people are born better runners than others, and long-distance running has never been my forte so I though this program might be good for me to try. The woman I spoke to at work recommended the NHS Couch to 5k program because you can download free podcasts for each week. Just download the podcast app and then search "NHS Couch to 5k." Today I completed the first week of the podcast. A very pleasant British woman tells you exactly how long to run and how long to walk, which is really convenient. For the first week, you are to complete the first podcast three times. You are to begin with a 5 minute warm up walk and then run for 60 seconds walk for 90 seconds, alternating back and forth until 20 minutes is reached- and then cool down with another 5 minute walk. In between her talking, some nice music plays. I will be honest with my thoughts about each week, so when I say something is easy please do not take it as bragging. For reference, I started the program with a running ability of probably around a 9 minute mile. My endurance was already pretty decent because of the Jillian Michaels, but like I said, running is definitely a different and very difficult skill, in my opinion. I thought the first week was super easy, very little challenge. The running for 60 seconds, walking for 90 seconds allows for long cool-downs between each run so your never really pushing yourself. 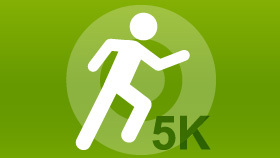 Keep in mind this is called COUCH to 5k, so it is accounting for people going from zero physical activity. The second run (first week) I took 3 pound weights with me to up the challenge. Our time is precious and I can't afford to be spending 30 minutes doing something that isn't going to produce results! The weights made it harder, but my shoulder muscle cramped up a bit half-way through which was distracting. I also looked like a total goon pumping my weights through the streets. The third run (first week) I ditched the weights but tried to make my 60 second "run times" more like slow sprints. So it became more like a sprint-walk than a jog-walk. I think I probably could skip till maybe the middle of the program, but I really want to see it out start to finish so I can give a thorough review! Overall, I like how gradual this program seems to build up running endurance, even if it did seem easy this week. I look forward to see how next week is so stay tuned for the next review!